Abseiling, also known as rappelling, is an activity you brush off with a confident "Pssh, no prob..." attitude when you're thousands of miles away, perusing tours on the internet. That attitude carried through on our ride to the cave, our guides quizzing us about the geology of the area while we cracked jokes in between. We were totally at ease with these dudes. As we suited up in smurfy-overalls and gum boots for "junior spelunker" training, the joking subsided, and their years of experience and dedication to our safety snapped into action. Time to learn, little birds; into the Lost World we go. While we thought we'd be rappelling straight away, we were instead treated to a nice hike that served as our crash-course on how to clip and maneuver carabiners while in the cave. 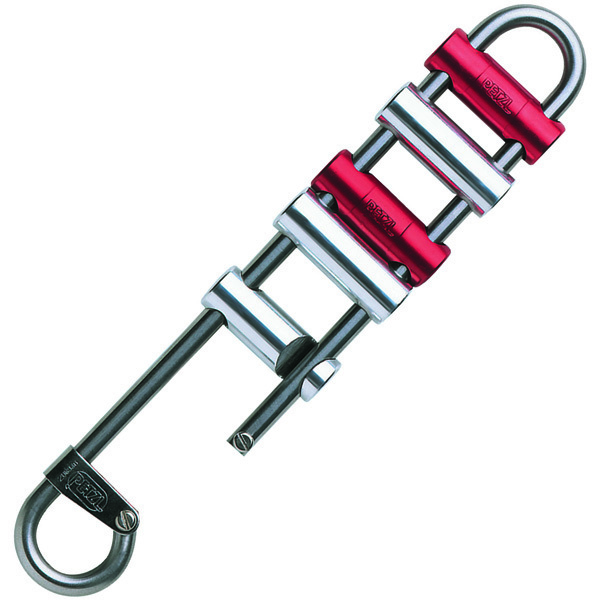 We had two carabiners that attached to our harness / wedgie machine and the sequence was: clip both onto the line, come to a switch point, unclip one and clip onto the other side, unclip the next onto the new side, repeat. Part of the fun of learning this sequence, if you consider your possible death "fun", was the threat of being caught with both hands on both clips. This meant you were about to do something incredibly stupid and would result in a "beer fine", which meant you owed whoever caught you a beer after the experience. Josh was almost caught, instead he got to keep his life. Did we mention how well this literal ropes course distracted us from the main event? At no point were we able to view what we were about to face, but when we arrived at the drop zone... well, nothing can amply prepare you for the true scale of what we'd signed up for. So long, misplaced courage! Since we're New Yorkers, we immediately thought of standing atop skyscrapers. The golden-trimmed, 33-story American Radiator Building is an accurate equivalent of what we were about to face from top to bottom. An experience like this requires ultimate trust in your guides, who were the lifelines in charge of our lifelines. While we dangled, swayed and twisted in a slight breeze, the guides became physics teachers, explaining the science of the fall and how exactly the equipment had our backs the entire way. Our speed would be controlled by the way we wrapped our feet around the rope. At this point, all that stood between us and flight was a contraption called a rappel rack, and our guides' ability to manually control our ascent, which was now underway whether we liked it or not. We were split into groups of four on the lines, one guide per each group, and we descended as a team. At first it took some coordination, guts and feel to stay together as a group, taking care to match the speed of our slowest link. Soon we became less troubled with the technical aspects and more eager to trust ourselves, taking in the astounding surroundings. This was the most unique vantage point of the most beautiful view we'd likely see in all our time in New Zealand, and that's saying a lot considering the country's endless natural beauty. The descent took around 20 minutes, and we were treated to a spectacular view the whole way down. Waterfalls and streams at the bottom of the chasm sent mist rising into the air, as the sun played its light off everything it could. Birds sang and darted around us, and the closer we got to the bottom, the more apt the gorge's "Lost World" moniker became. Even though daily tours are run, it truly felt like stepping into another world few are privileged to experience. We took time to explore the cavern floor, our guides snapping pictures for us along the way (no cameras allowed). The stream that emerged from the cave ended up a roaring waterfall at the opposite end of the cavern. Leaves rained around us reminding us of autumn back home, even though it was a budding spring in the southern hemisphere. Unexpectedly, mostly because we didn't know much yet about New Zealand's wildlife, we got to meet the area's resident octogenarian New Zealand longfin eel. We would have been satisfied with these moments alone, but in the words of the late American poet Billy Mays... 'BUT WAIT, THERE'S MORE!" Amid all the excitement and adrenaline of having completed the most treacherous aspect of the experience, it was easy to forget we have some cave left to explore. Scrambling in over large boulders, one guide pointed out light coming from the cave's ceiling. Originally discovered by land surveyors, the Lost World cave nearly claimed its first victims through holes in its porous limestone ceiling. Like the gorge we came down, the cave's 275 foot ceiling is no joke. Once inside the cave, we stopped for tea, chocolate and more chat about the area's history. Combining its oceanic origins with volcanic activity (NZ in a nutshell), Waitomo's geologically-youthful cave system is dotted with fossils of giant oysters, fish and bones of fauna that happened to find their way in through the top or more gracefully otherwise. In Maori, wai means water and tomo sinkhole, which judging by the size of this cave was a bit of an understatement. A bit further in, we were instructed to turn off our lights and sit silently with a small contingent of glowworms the Waitomo cave system has become famous for. While Lost World isn't the best cave for glowworm viewing, it was surreal to be in the pitch darkness save for these faint imitations of stars above us. Eventually we had to snap out of our respective trances in preparation to make our way back up and out. But how? Our bobbing headlamps eventually shone across a cold, steel-runged ladder that rose endlessly into blackness. "Is this how we're really getting out?" someone asked. "Yeah!" our guide replied enthusiastically, "Josh you're first. Let's get you strapped in." "Sh*ttttttt..." Josh said, wondering if this was penance for too many correct quiz answers on the ride in. The common theme of this adventure seemed to be "nothing prepared us for x", and this was especially true of the damned ladder. We don't remember how tall it was exactly, because no one heard the answer over their own heartbeat. It had to have been least 90 feet. ...but you keep going, because damn it, YOU'RE A CHAMPION! Words of encouragement from heaven below and the guides above signal that you're close, giving you a much needed last wind. Just as you've reached the apex of "nomoreplease", a guide-angel's arms reach down and help spring you from the abyss. Chest heaving, you think this must be what baby's first moments are like. All eight made it through the ladder challenge, some needing more "encouragement" than others, but that was the beauty of the ordeal. You didn't know who'd pop up next or how long it would take, but you were always ready with the high-fives. The sense of accomplishment rode high as we tramped the remaining beautiful half hour out of the cave. What a rush! We highly recommend this particular abseil experience if you find yourself in New Zealand. Cheers to our fantastic guides at Waitomo Adventures, Chris, Nathan and Iain, who made it an unforgettable, safe experience. Tips: If you happen to get there early, there's a nice 30 minute hike to a former Māori hilltop village next to their office. No cameras or GoPros are allowed on the tour, but the guides take excellent pictures for you along the way. Do some pushups in the weeks leading up, it'll help with that ladder thing. Note: all photos in this post courtesy of the Waitomo Adventures staff.